It was a Monday morning shortly after sunrise and I was balancing on some slippery rocks in shallow water trying to keep myself upright. Clutching Matty’s hand, I attempted to move my left foot forward onto the next rock but then something soft, solid and slippery hit me, sending me off balance, causing me to slip waist-deep into the water. 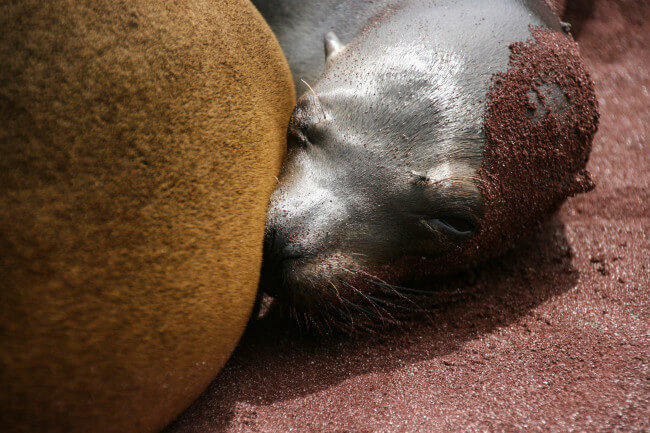 “I just got head-butted by a sea lion,” I squealed, watching the pups swim around me and through my legs, before making their way to Matty to try their tricks on him. There were about five of them playing in the water together, swimming, jumping and diving like dolphins through the waves. The day before we had watched them surf together – we sat for what felt like hours, mesmerised by their playfulness, as they waited for a big wave to come from behind before swimming with it, letting it carry them to the shore before diving over the surf as it broke in the more shallow waters. Over the last eight days we have watched the pups take some of their first confused steps, swum and played with them underwater, observed how they sleep and live in their colonies and giggled at their quite human-like behaviours. It was basically torture not being able to stroke this sandy beast’s neck. This little beauty was stumbling all over his mamma. And drank beers with them. I might have tried to take one home. 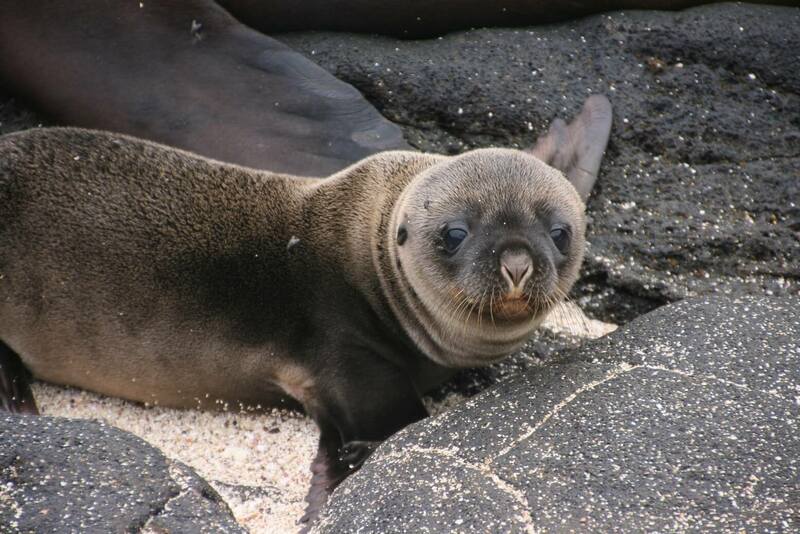 It’s impossible to take a bad photo of a baby sea lion. Even if Matty jumps in the photo with one. 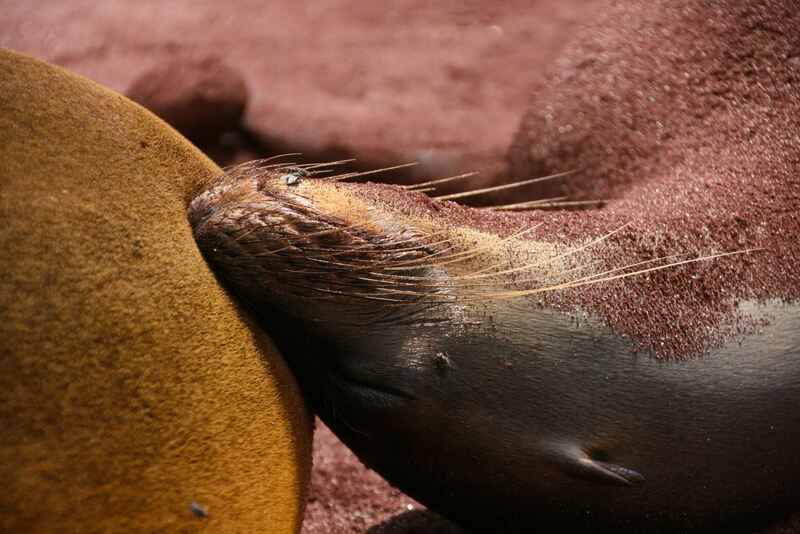 But it is not just the sea lions and fur seals that allow you a wonderfully close and personal insight into their splendid lives on the Galapagos – in fact there is not one species that does not seem to welcome you with open arms, or at least lazily open one eye to you. And 500 years later it appears little has changed. They seem to regard humans as nothing more than a sometimes inconvenient shield from the sun as we peer down at them, blocking the sun’s rays as they sunbathe. Rest assured we did not ‘catch’ or touch the animals – we had a wonderful guide who ensured we were always two metres from the animals, as is the national park’s rules, but it was fascinating to be within an arm’s reach of some of the world’s most treasured and unique species. 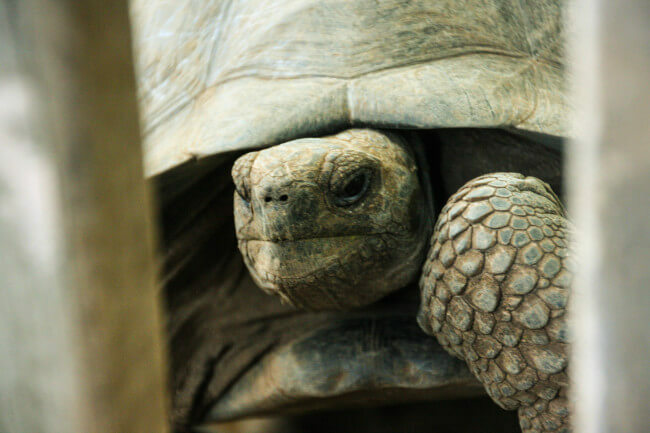 It was only appropriate that the first animal we saw on the first day of our 8-day cruise in the islands was the giant Galapagos Tortoise, which gave the islands their name. 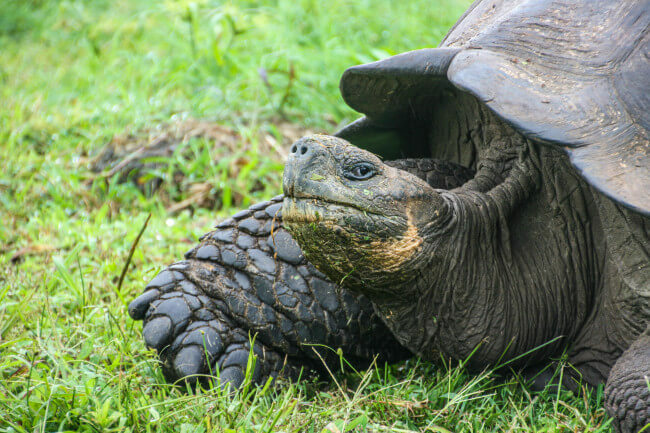 Roaming the highlands of the islands, these huge tortoises dwarf everything around them. I stared at their huge, wrinkly legs and long, weathered necks as they slowly grazed their way across the land, and was struck by how pre-historic they appeared, as if lost creatures from a few Millennia ago. I giggled as one approached another causing it to hiss and tuck its head into its shell in a fairly defenceless manner. Just hanging out, munching some grass. It was about half-way through the trip that I realised with some horror I was probably going to spend the rest of my years as a ‘twitcher’. Suddenly, I couldn’t believe I had thought it was acceptable to travel without a pair of binoculars and a bird book and made a mental note to add these to my travel kit at the earliest possible opportunity. It started with the penguins. And they were marvellous. Sitting proudly on the rocks, our little dinghy floated right up to them and they barely gave us a sideways glance as they ruffled their feathers. 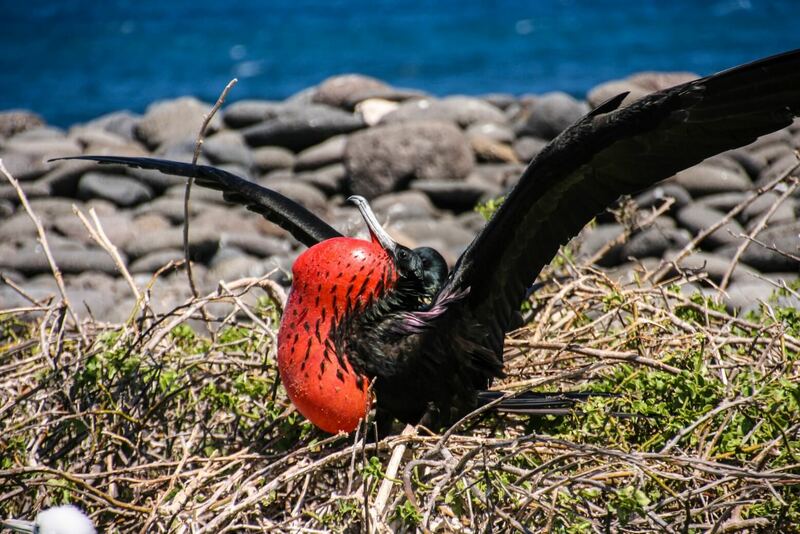 But then came the boobies and the frigates; some of the most iconic creatures of the islands – I hadn’t dared hope that I might see them close up. 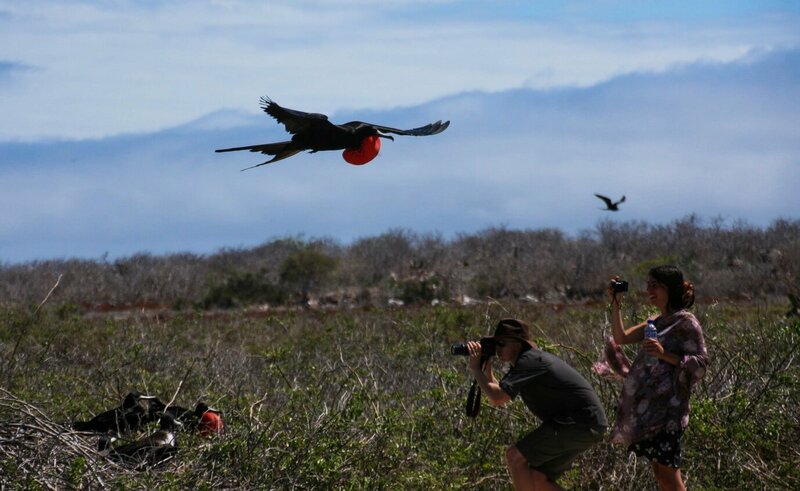 But then we visited North Seymour Island, home to vast colonies of both birds, and my dreams were to be realised. They didn’t even flinch as we approached them. 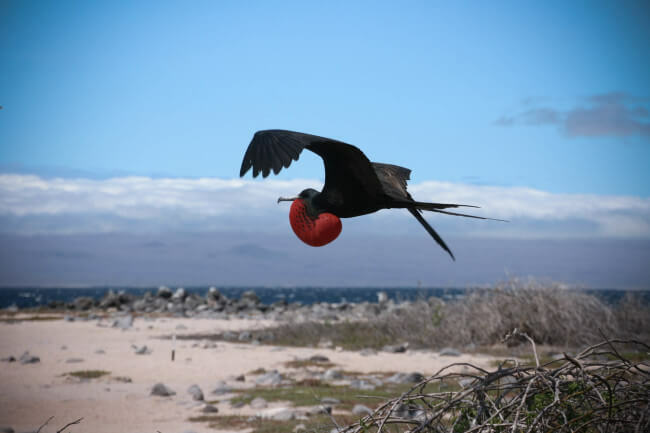 The male frigates were blowing our their impressive red chests, which looked like gigantic balloons that could lift them into the air and carry them away. 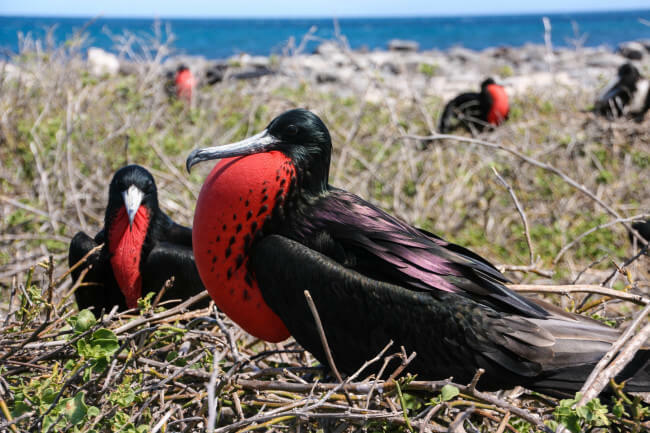 They made a fantastic sound as they drummed their beaks on the tops of their chests and sang loudly to attract the ladies. 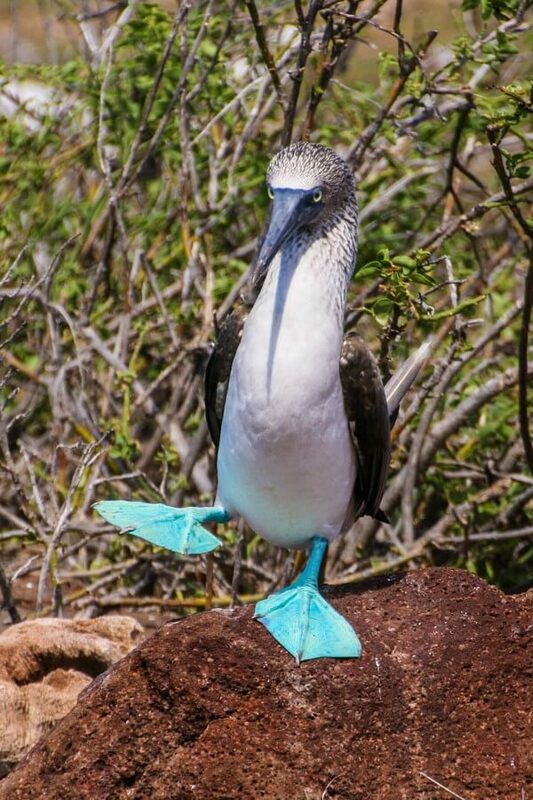 Meanwhile the boobies danced on their big, blue feet and nuzzled their white fluffy chicks, completely unfazed by our arrival. For the next hour I had to remind myself to keep breathing as I snapped away, just a couple of metres away from the most beautiful birds I have ever seen. Not for the first time in the Galapagos, I felt like a fly on the wall – a fly on the wall of the most beautiful room in the world. 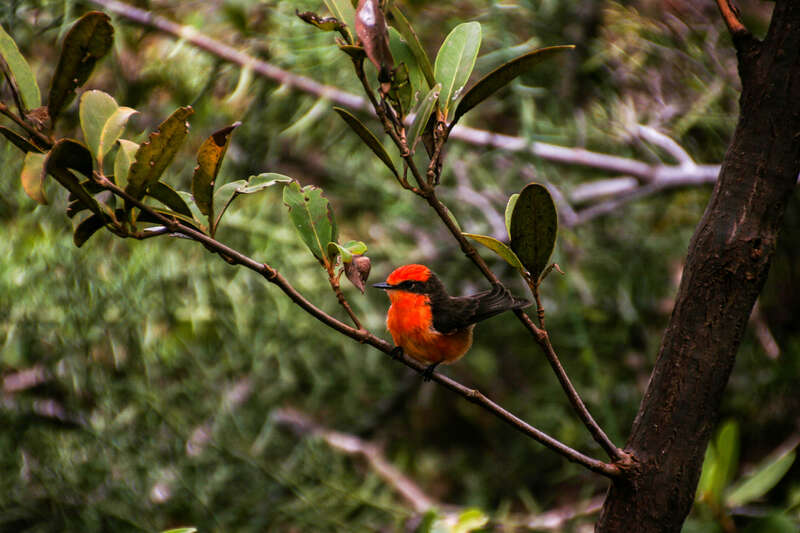 But this one might just have the best name of all: The Galapagos Vermilion Fly-Catcher. 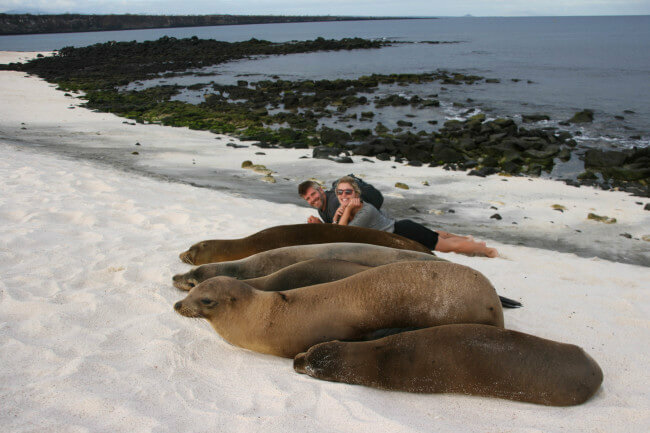 In the Galapagos it is not just about seeing the creatures – but studying them – observing how they live, eat, sleep and mate. When we stumbled across the huge yellow land iguanas (that despite looking relatively menacing seemed as passive as a mouse) we watched in fascination as one rolled the fruit from the cactus in the ground with its feet to remove the spikes before swallowing it whole. 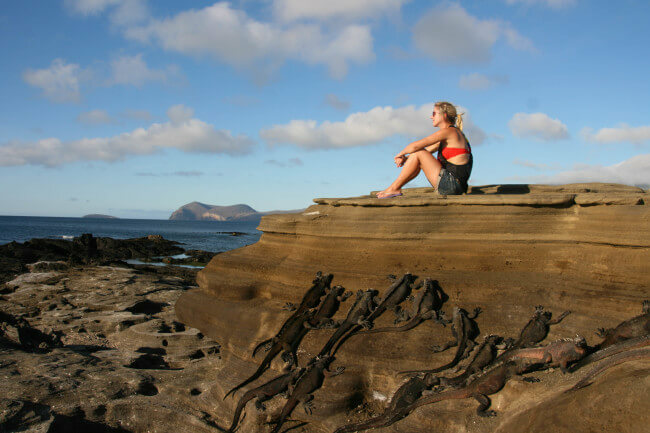 Meanwhile, the marine iguanas, which cannot be found anywhere else in the world, were a delight to watch at sunset as they bobbed in the shallow water for food before sunbathing on the rocks to dry off. Although if you are a cactus fruit you will not be spared. With no underwater camera, I was unable to capture the wonders that we saw below sea level. 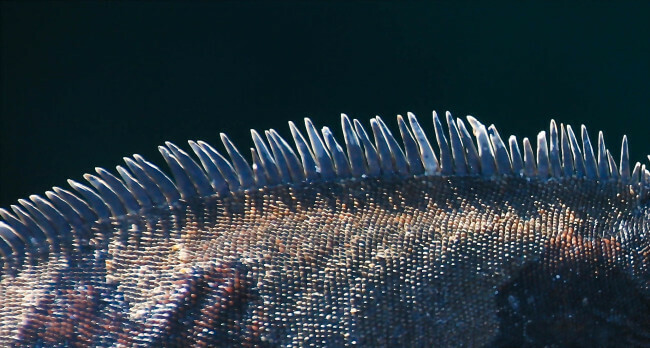 The Galapagos is blessed with abundant shoals of tropical fish, which we followed for as long as possible with our masks and snorkels. 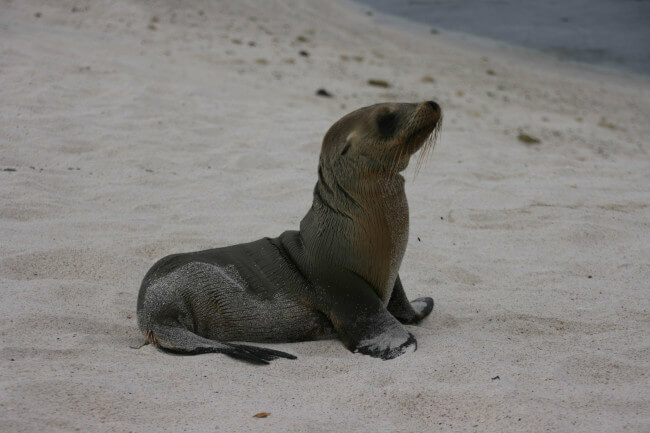 We were lucky enough to swim with the sea lions and even followed white-tipped sharks a number of times. But best yet was following the sea turtles that seemed to fly through the water with the ease of the birds in the sky. What we did try to capture with our camera, was the impressive and varied landscape of the islands. I think the perception is the islands are tropical castaway islands with gorgeous beaches but this couldn’t be further from the truth. The islands are volcanic – they were created by huge volcanoes that erupted from the Earth’s core millions of years ago. 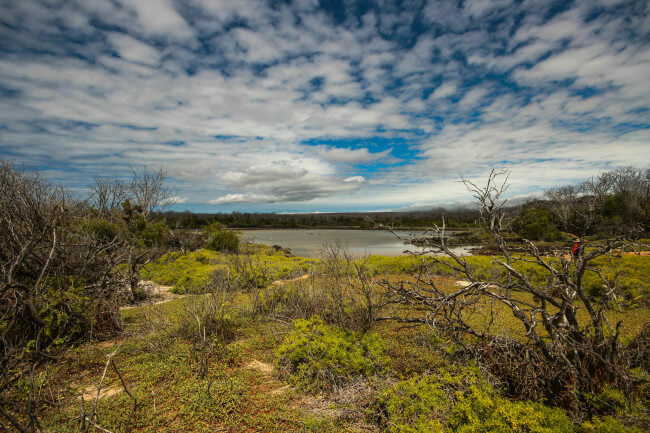 We crossed black, hardened lava rivers, gazed into huge craters, walked across desert-like landscapes scattered with cactuses and of course, also strolled the beautiful beaches that were postcard-perfect. Winding paths to the highlands. Us modelling the white sandy beach. After eight long days of observing the landscape, the mammals, the birds and marine world, I felt ready to join the real world once more. I had enjoyed being rocked to sleep on the boat each night but was looking forward to having a hot shower in a proper bathroom and finding out the results of the Scottish referendum. But after we said goodbye to our wonderful guide Leo and took a seat on the bright red plastic seats of the departure lounge at the Galapagos Airport it suddenly hit me what I was saying goodbye to. I watched “Darwin’s finches”, as the little birds are known as, scavenge for food in the brightly-lit food court of the airport and felt my eyes well up. 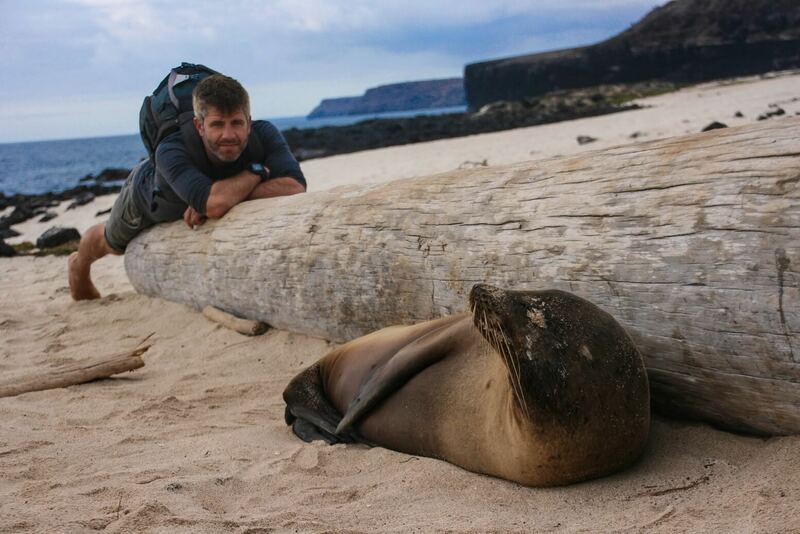 I would no longer be waking up and playing with sea lions, I would no longer feel like the greatest bird photographer (as the birds in the rest of the world fly off when they hear my clumsy foot break a twig a mile away), and I would no longer watch the birds feed at sunset or watch the sun rise over the equator every morning. 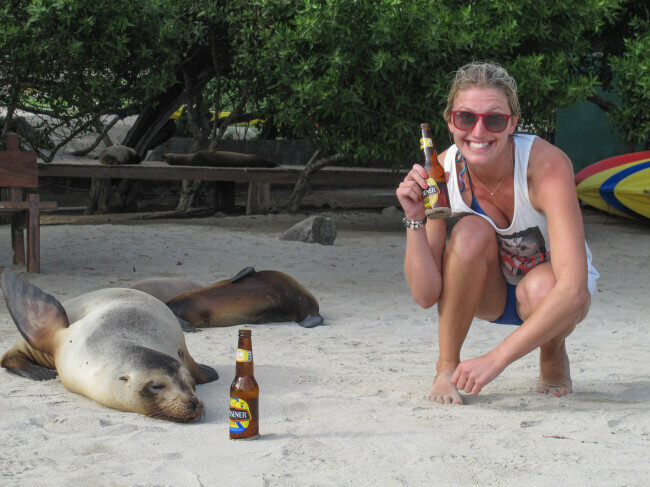 This is a world where sea lions hog benches like the drunk old men of the west and where it is easier to trip over a camouflaged marine iguana than it is to stumble on a rock. And I realised I would never really be ready to leave it. As I grumpily stomped around the airport, which is decorated in “I love boobies’ t-shirts, I glanced up at another t-shirt with a Charles Darwin quote on it: “It is not the strongest of the species that survives, nor the most intelligent that survives. It is the one that is the most adaptable to change”. We went on an eight-day cruise in the Galapagos with King of the Seas, which is an ‘economy’ boat. There are four different classes of boats and this is one of the cheapest ones – but it did not find it cut corners on the stuff that mattered. Yes the cabins are tiny and the electricity cuts out regularly, but the food was absolutely delicious (and plenty of it), the crew and captain were wonderful, friendly and helpful and our guide Leo was top notch. It attracted like-minded people and we had a superb group of travellers on board with us. 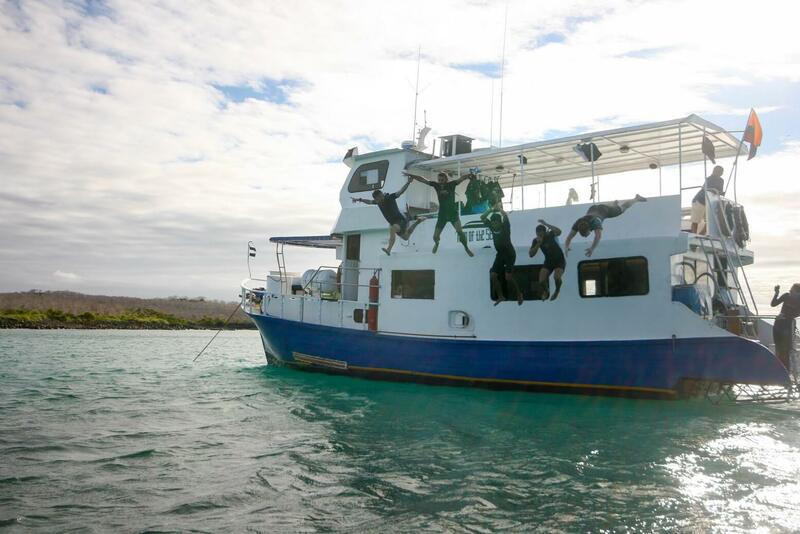 Our lovely group… jumping off the boat. Deciding how to travel the Galapagos is tricky. 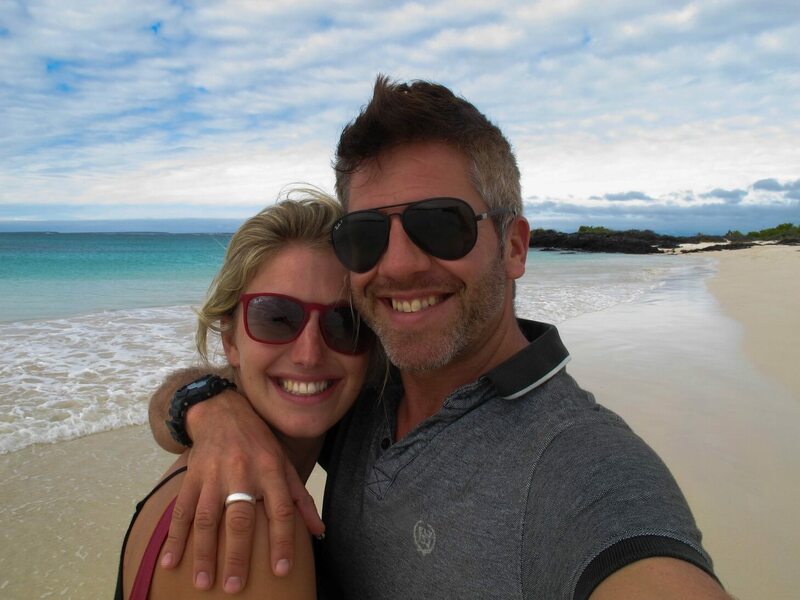 We were told by a number of people that those who travel it overland (eg taking day trips from an island base) don’t see as much as people on the cruises and I think that this is probably true. We woke up in a new location every day so wasted no time travelling as this was always done as we slept – we snorkelled twice a day most days and visited at least two locations a day on foot. We got into the nooks and crannies of the island with an expert guide, which would be impossible to do alone. How much does it cost to go to the Galapagos? It is not cheap. We struggled to justify it and almost didn’t go at one point because of the cost. 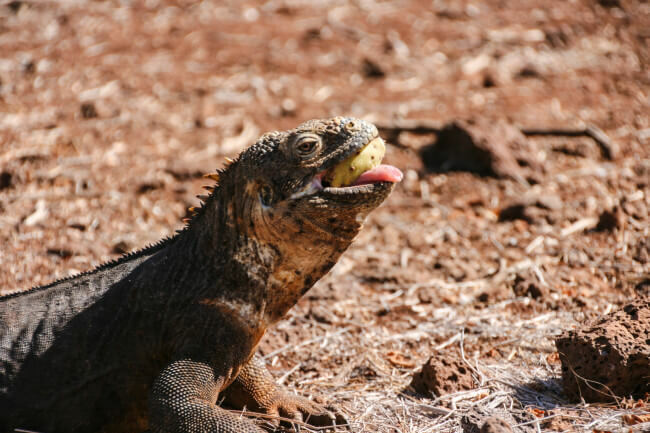 One week in the Galapagos cost us what we normally budget for one month travelling (£1,000) but it was worth every penny and we were rewarded with an experience that I have never had in a whole month of travelling elsewhere. It costs about $500 before you have even got to the Galapagos – return flights from Ecuador are about $400 and then you need to pay an island tax of $100 when you land. Then comes the cost of the cruise… We got a last minute deal for King of the Seas for $1,200. (Snorkelling gear and wet suits hire is often not included on the cheaper cruises and we paid another $50 each for this when we boarded the ship). We booked the trip about three weeks beforehand at a great agent in Quito (Ole Expeditions in the Old Town) – we met a couple that booked it the day before, directly with the cruise liner to avoid agent fees – they got it for $1,050 – so we didn’t do too badly. The final cost to add into the equation is tipping – and any drinks you want on board. We were told to tip 10% of the cruise cost or $10 per person per day. Drinks on the boats are naturally expensive ($30 for a rubbish bottle of wine so take lots of your own booze on board!) Those considering to do it ‘over land’ should bear in mind that day cruises can cost anything from $80-150 per day per person – and food and accommodation is expensive on the island. 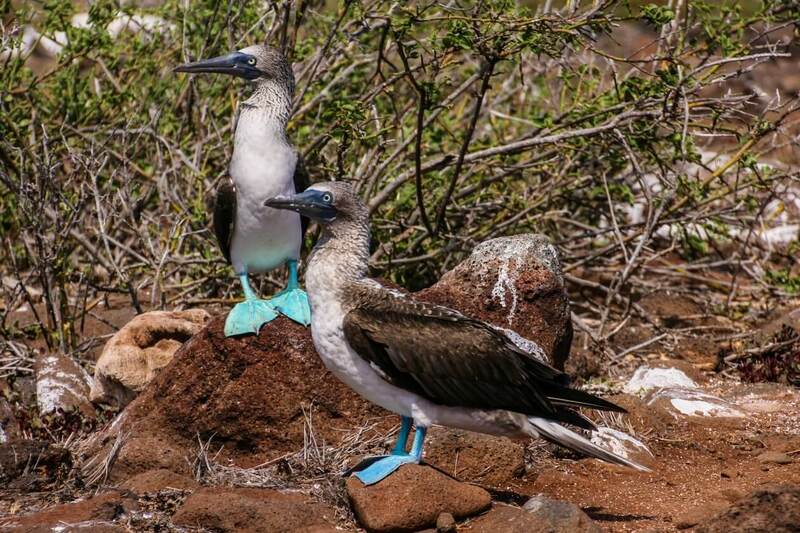 How long should your cruise in the Galapagos be? Cruises tend to be four, five or eight days long. We initially planned to do a four day cruise but decided to go on a cheaper boat for eight days in the end. 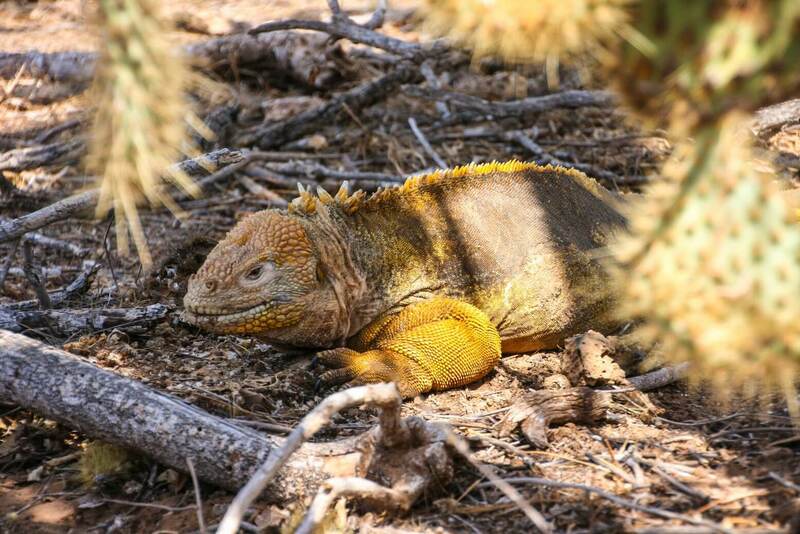 While everyone will have different feelings about what is the ‘right amount of time’ I loved that we finally decided to do eight days because it meant that we saw every single species I had hoped to see. 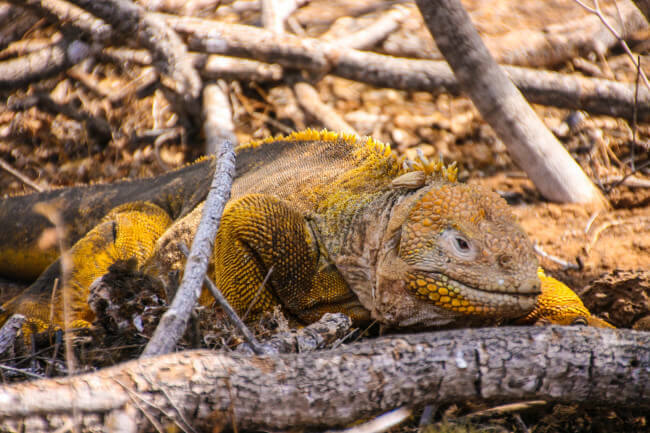 If we had left after four days I wouldn’t have seen fur seals or swum with turtles and sea lions and if I had just done the last four days of the cruise I wouldn’t have seen frigates, giant tortoises or land iguanas. Eight days almost guarantees you’ll see it all – or at least it did for us! We were in the Galapagos in September which is winter for the islands. Of course we are talking about winter on the equator so it was a bit like a British summer – gloriously warm and sunny most days, but sometimes cloudy, and chilly in the evenings. It was dry but the water was quite cold and we definitely appreciated having wet suits for the snorkelling. 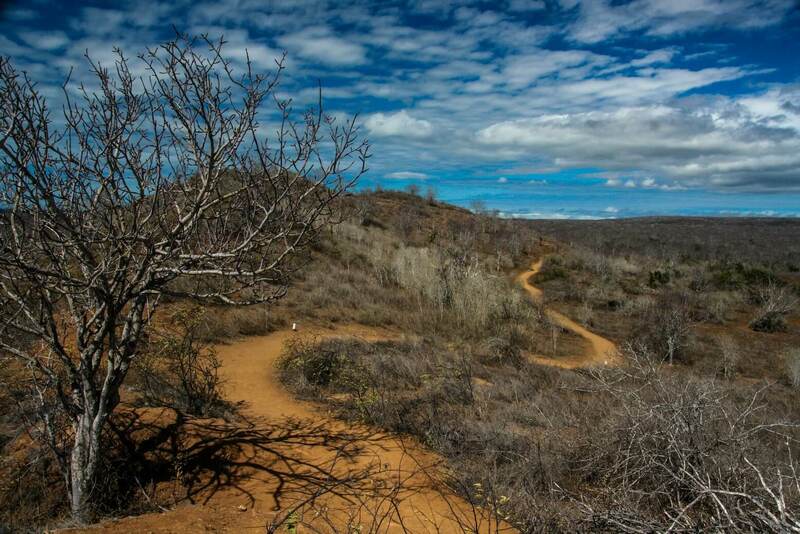 The hottest months are January to March, but this is also the rainy season. We have been told April to June are nice months to visit, and July and August are apparently the ‘peak season’ where the islands are much busier and you are more likely to have tourists in the background of your photos.